there are some things to consider and understand. You can’t do it carelessly because it may jeopardize the work itself. However, you don’t need to do any grandeur work that may cost you too much. As long as you are clever and creative enough, you should be able to handle all the work quite easily. It is important to note that bathroom makeovers don’t always have to be costly. You can do a simple work that still creates a stunning effect. Even with the simplest change, you can deliver that ‘oomph’ effect that makes your bathroom isn’t only better in functionality but also more appealing to the eyes. It is a good thing that there are some handy tips and tricks that have been compiled from the best experts in the field. Read their guidance, tips, and how tos and you should be able to transform your bathroom into something beautiful and authentic. Here are the 20 things that you can include in your bathroom remodel project. Just because you aren’t used to tiling the shower, it doesn’t mean that you can’t do it. If you check different sources and websites, you will see that their methods are fairly the same. The key element to doing it all is to be patient, thorough, and not rushing things. Do you know that there is actually a tile kit that you can use to help you with the installation? It comes with a level, spacers, and other things crucial for your actions. You need to have two tiles first for the bottom area. Make sure that they have come with the right pattern – feel free to play it the way you want it. Turn the tiles, make it downward, backward, or anything else until you have come to the right pattern. Once you have found the ideal pattern, you can start from the bottom. Keep in mind that the bottom row is the most crucial section. If it is level, then you can be use that the other rows up will be level too. However, if the bottom row isn’t level then you will have a problem. The most important thing in the bathroom remodel work is to take it slowly and carefully. Once the tiles are set, let it rest overnight or some nights. Rushing things won’t help at all – trust me. What is wainscot, anyway? It is basically a pre fab board extending to 48 inches high to cover any wall minor holes or dings. The principle of using the wainscot is to cover or resurface instead of replacing it. Imagine the cost of replacing the entire wall or wallboard – when compared to covering or resurfacing it up. Of course, you also need to use your logic when doing this. If your wall is already filled with mildew or mold, you will HAVE TO replace it because covering it up will only make it worst. The idea of covering or resurfacing it only applies when the material is still in good condition. In the case of mold and mildew, it seriously needs replacement instead of coverage. So, what are the tips in using the wainscot? First, you can get creative with the color. Yes, it is okay to combine two different colors or hues within the same room. If you have incorporated the single uniform color, this bathroom remodel work will give you the best chance to change the existing design and style. Instead of spending money on new things – which can hurt your wallet seriously – why not buying used items? You’d be surprised to know that you can actually buy used bathtubs, toilets, mirrors, cabinets, and sinks without having to compromise the quality. Look for Etsy or Habitat for Humanity ReStore that will provide everything you need. Visit Etsy and type in the upcycled and you will be presented to tons of items that aren’t only good for your bathroom remodeling work but even for the entire home remodeling purpose. Just because they are used, it doesn’t always mean that they are lousy or bad. Try it and see it for yourself. So, how to remodel your bathroom without spending too much money? This is probably one question that most homeowners have. It would be a good idea to leave the plumbing intact and only change the surface items. Unless you are super loaded, moving the drainage or the water supply will be super expensive. It would be wise if you can focus on installing the new shower tiles instead of moving the shower. Or it would be okay to replace the cabinets and sink instead of moving the sink to other spot. If you still want to move the plumbing, just be ready with the budgets and don’t be too surprised if you have spent an exorbitant amount of money. Another possible method in doing the inexpensive bathroom remodel work is to have DIY plumbing project on your own. You probably have heard about PEX plumbing that allows even the amateur homeowners to manage their own plumbing work. With this system, moving the drain lines or the sink supply will be possible although it would be impossible to move the sewer line. Instead of dealing with the galvanized pipes or soldering the copper pipes, you can easily use the PEX pipes and Sharkbite fits with their easy push-in mechanism. Try it and see how it works for you. Choosing granite countertops may be a good idea because of its long lasting feature and its sturdiness. However, buying the granite countertops is still an extra spending. So, what can you do to reduce the cost? First of all, choose the unique colors – not the light beige, brown, or tan. These colors are popular so they will likely be expensive. Second, choose the granite countertops with imperfections. The more they are, the cheaper they will be. It’s okay considering that you will also include the sink and it takes quite a space. If you are clever, put the clever on the area of the sink to hide it. This is one of the simple bathroom remodel ideas that won’t cost you a fortune. Grout and caulk may be simple and (seemingly) unimportant. But when you can focus on such small details, you can actually improve the bathroom look and complete its appearance. They are inexpensive – costing only a few dollars – and yet they can really transform your bathroom in the simplest manner. If you don’t believe me, include this work in your bathroom remodel and you will be surprised to see the difference. Even better, take before and after pictures – you will then realize that such a work can be magnificent. More info. Have you ever thought about relining your old shower or bathtub? Surprisingly, it isn’t as expensive as buying the new item. One of the biggest concerns in the bathroom remodel work is the cost. Well, relining them will determine your inexpensive spending. When you decide to buy new items, it is going to be costly – which is okay if you have the budgets. But if you are rather low on it, think of something else. Be creative. Sure, hiring a professional designer will guarantee a stylish result. But don’t forget that hiring such a professional worker will seriously hurt your wallet – well, unless you are loaded. The best thing that you can do is to be your own designer. Yes, try designing everything on your own without moving or changing the main plumbing lines. Doing superficial work can transform the look and ambiance of the bathroom – something that most homeowners can do. Not to mention that there are tons of designing apps that can be used to help you with the process.For choosing bathroom paint colors, for how to pick bathroom tile. 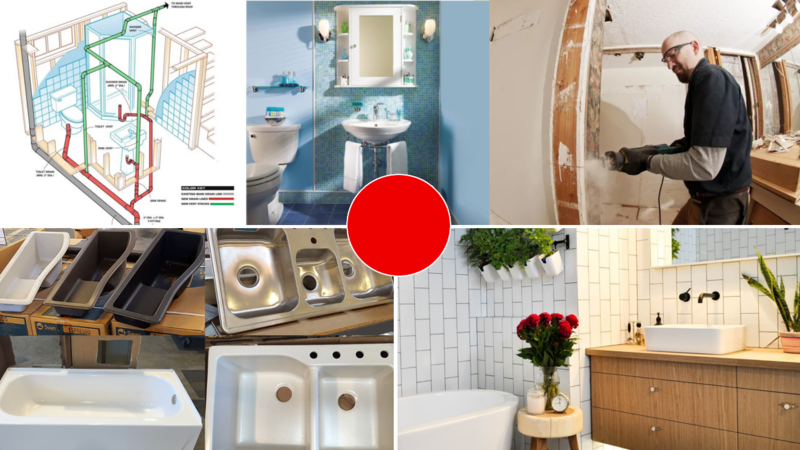 If you finally decide to hire a contractor or a designer or other services that will help with your bathroom remodel project, be sure to do an extensive research. Before rushing in to make a decision, it is best to do it slowly but carefully. First of all, have your own design and then talk it out with them. They are great when giving you insight of what to do with the installation, etc. But they aren’t designer. Second, supply your own material – it would be cheaper. Even a small bathroom remodel work can be costly and supplying the material will save you from having to spend a fortune. Third, think about the deadlines. Missing a bathroom (provided that you have extra) is fussy – let alone if you only have one bathroom. Think about the tight schedule and how to manage it. If you are looking for a third party service that can save you a lot of money, go to Fiverr and look around for the cheap bathroom design proposal. You’d be surprised that there are tons of creative talents that out that won’t hurt your wallet by a bit. Of course, you should select the service providers so you only deal with the professional ones but be sure that you can always find inexpensive services anywhere – as long as you are putting all your best efforts looking for them. Would you believe it if I say that you can do a bathroom remodel with less than $300? The basic idea is to keep the crucial one, remove the unimportant one, and update the existing one. Remodeling the bathroom doesn’t have to be costly. Sometimes, changing the color of the wall, repainting the vanities, and changing the hardware will be enough. Such simple work will surprisingly transform the overall look of the bathroom. Try it and see the transformation by yourself. So, if there is a question how much to budget for bathroom remodel? Well, it depends on the homeowners: do they want the simple work? The glamorous result? The extravagant details? The budgets will go along with their requirements, for sure. Sometimes, adding the smallest details will immediately make the room look different. When you combine it by changing the color of the bathroom, the outcome will be immediate. For instance, let’s say that your previous color was white and you decide to change it blue now. It can create an immediate outcome. Don’t forget that details can affect too. For instance, the front side of the bathtub was plain but once you add moldings to it, it looks different now. Let’s say that your mirror was previously frameless. If you add wooden frame now and match it with the existing paint color, you will create a different atmosphere to the room. It doesn’t have to be difficult or costly. Even doing the simplest thing can make it different. One thing that most homeowners often miss about doing their bathroom remodel work is the hardware. In reality, changing the hardware alone (without changing the overall look of the house) will create an instant change. There are different types of hardware out there, but here is an idea: choose the rustic vintage industrial type to make your bathroom look smashing – and they won’t be costly either. Repaint the cabinets along with the hardware. It doesn’t have to be matching all the times – sometimes making them contrast will create a stunning effect. Add extra shelves. Extra shelving won’t only help with storage but also with visual design. Add small details. Adding frames to the mirror. Have a DIY towel bar or towel ring. Adding small items will change the look but don’t overdo it. The simpler it is, the better. Do you have a plain and flat bathroom door? What about making it paneled to create a different effect? Yes, you can make it paneled by following the instructions – they are available across the net. The process doesn’t take more than a day and there you have it – a door that is less boring and plain. Most homeowners fail on this, thinking that they need to focus on what’s INSIDE the bathroom and forget the door. But changing the door will also create a different effect. If you have small bathroom, there are some things to create a more spacious effect. For instance, the bulky and heavy items (like bathtub and shower) should be placed the farthest from the entrance. It will create a roomier effect. Don’t forget about room natural flow – from the heavier to the lighter. Let’s say that you place the bathtub on the end, followed by the cabinets, the toilet, and the sink. Or you can also try this: the bathtub, the cabinets with the sink, and the toilet. It creates a movement – a stylish flow that everyone can benefit. In the next step of doing the bathroom remodel, we talk about grout and caulk. But cleaning and refreshing its look can be super easy. Try a brush with stiff bristle and plain warm water. Brush it with circular motion and let it dry. If it doesn’t work, try baking soda and water. If you want to add the cleaning strength, spray the vinegar so the grout will be cleaner. Mix the vinegar with water so it won’t be too acidic and strong. Once you spray the vinegar, let it for a while. Then scrub it off with the brush. It should be enough to clean the grout. Do you know that there are inexpensive paints that you can try to help you change the look of the bathroom? By repainting not only the wall but also the vanities, you will create a fresher look with the new hue. Of course, it is advisable that you get advice of which paint to choose and how to do it correctly. If you want to go through this path, make sure that you have chosen the right palette – and you are sure that it will create the desired effect that you want. Once you choose the color, pick the finish, and make planning, you can start clearing off the room. These are the basic things to know about repainting a bathroom. Find out more detail here. All in all, transforming and refreshing your bathroom doesn’t have to be difficult. As long as you know the steps, planning and executing the bathroom remodel work is possible – and it can be fun too!